"A fast way to make delicious ice cream without compromising quality. Use any frozen fruit in place of the strawberries." 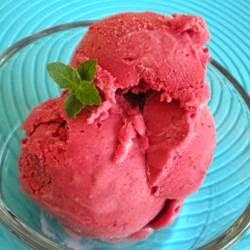 Combine the frozen strawberries and sugar in a food processor or blender. Process until the fruit is roughly chopped. With the processor running, slowly pour in the heavy cream until fully incorporated. Serve immediately, or freeze for up to one week.